Comments: The art is simple. The eyes are lines or featureless. The people seem lifeless. Donald’s face looks bloated. Spelling needed to be proof checked. Trump is shown here with some strange things. He wants to sleep with his daughter, have Mexico build a wall, making fun of disabled people. Yes this is the guy that wants to be the President of the United States. Trump is a fascist, a racist, he lies and hates women. Wow this comic does paint one awful picture of what Donald is like. Is it all true, maybe. If it is and this man becomes President the country will be in sorry hands. 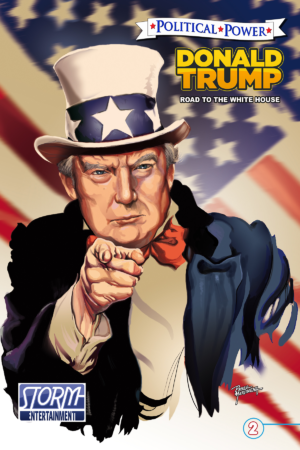 The art is really bad but the story itself moves along nicely and portrays Donald exactly as he comes across in the media.